Stunt action drones - All you need to know about drones. Stunt action drones All you need to know about drones. 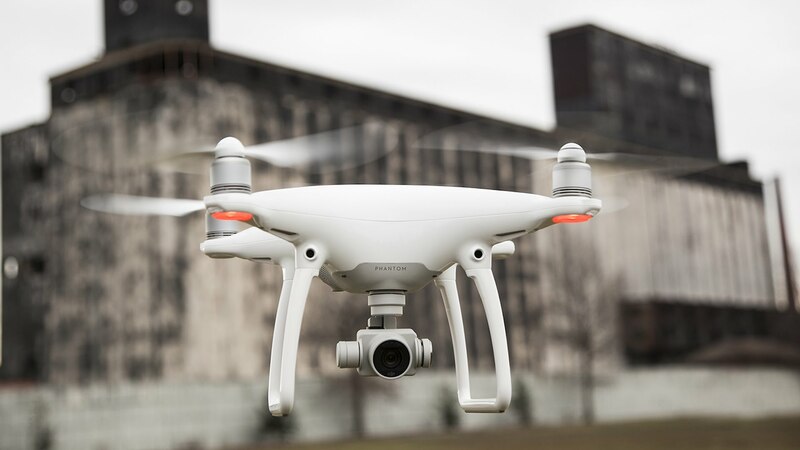 Specifications – technical things that can be measured and are present with ALL drones. When it comes to the important ones, we must include gyro systems, navigation systems, return to home… and of course – follow me drones function. Many people overlook it, most likely thinking it is nothing special. But, oh boy are they wrong! When it comes to actual handy scenarios in which various functions can be used, it does not get much better than the follow me function. Why is that so? Well, stick around and you might just find out! How does the “follow me” function work? If you are wondering about how the actual function works, don’t worry I got you covered. As its name suggests, all this function does is allow the drone to follow you around anywhere you go… Well, technically it is following the transmitter, not you, but I guess you could have realized that part on your own. The drone will keep a safe distance from you but will track your every movement which will result in pretty great shots. If you just bought a drone with this function and you can’t think of great usages for it, then rest assured that I will help you with this issue! First of all, you need to understand that, in order to effectively use this function, you need to go outside and do some interesting things. For example, the follow me function excels at recording extreme sports such as skiing, mountain climbing, surfing and similar stuff. In addition to these, you can simple take a walk through the busy streets of your city and order your drone to follow you around like some sort of a pet. It’s like eating a pizza with pineapples – It’s definitely going to be weird at first, but once you get accustomed to it you will love it! 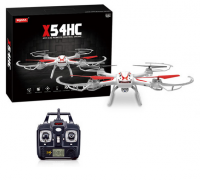 Syma X54HC is perfect drone for kids! Syma has recently released two brand new low-cost quadcopters aimed at beginners. The X54H series. Together with new improvements to their older series (check our previously reviewed kid drones from the old models now upgraded): reviewed Syma X8HC (upgraded version of the X8C Venture) and Syma X8HW and X8HG both WiFi FPV fliers. From the new X5H series we have reviewed the upgraded version of the widely sold X5C the X5HC and the upgraded version of X5SW the X5HW. Today we review X54HC from the new X54H model. This series resembles the X5H series in many aspects, however it is even cheaper! Yes, if you thought it was impossible to buy a good drone for even less money you are wrong. Syma took into consideration both price and quality and manufactured this super affordable drone line of quadcopters. Best thing is they also feature Altitude Holder (also known as Barometer Set Height). Yes! They actually included this new innovative feature in a drone this cheap! However, Syma X54HC does have some important negative aspects which I will mention further on after I discuss the features. Let’s move on to our Syma X54HC review. 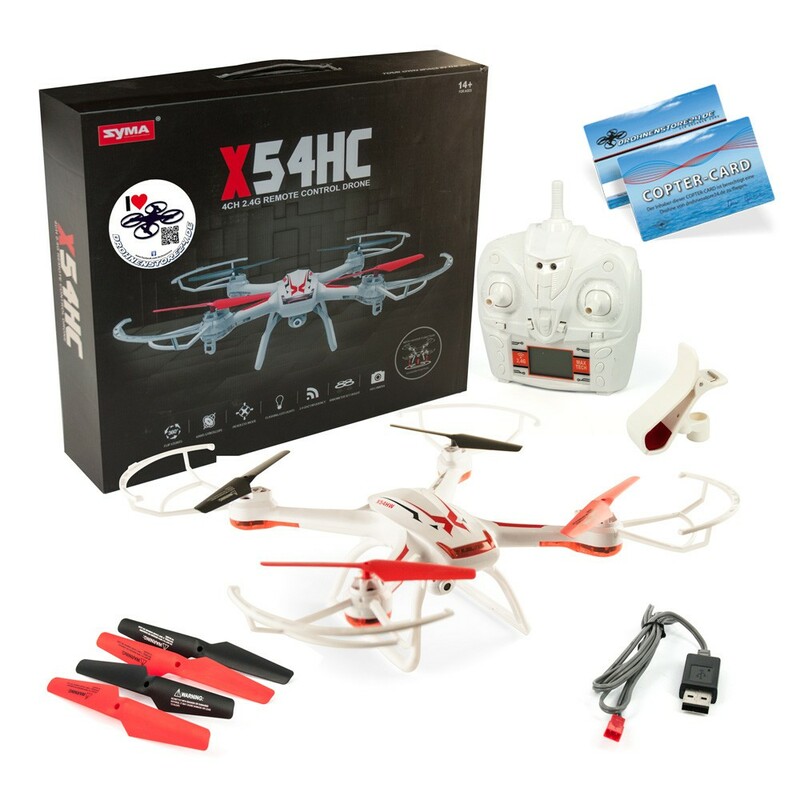 What makes Syma X54HC special drone for kids? First of all, let’s start with what makes Syma X54HC stand out from the rest. Besides the already mentioned incredible affordable price, X54HC is actually the cheapest camera Toy Drone (at the moment) featuring Altitude Holder. This feature is still very rare among low-cost Toy drones, it used to be restricted to higher-budget drones, and however companies like Syma and JJRC have started to introduce this amazing function in their RC Toy drones. Altitude Holder is a great feature for photography and videography. Syma X54HC has a sensitive barometric pressure sensor (barometer) to measure air pressure and keep the drone locked at the desired height, hovering autonomously, without much pilot’s input. This allows pilot to focus on recording the video or taking photos while the drone hovers steadily. Imagine the possibilities! Besides this amazing and useful function for photos and video, Syma X54HC also features more common functions such as Headless Mode (easier orientation despite where the drone’s front is pointing at). Headless Mode is great for beginners and children as it makes the drone much easier to control, and since this is the aim of this model it is a great addition. Besides this, it comes with now very common features of LED lights for night flights and 360º aerial roll-over to amaze the crowd at the park. A good set of features, especially considering the low price of this Syma quadcopter. Now let’s talk about the included camera. It seems to be the same used in previous X5C model, which obviously doesn’t show any improvement. However, the camera was, and is, decent quality considering the price of this Toy quadcopter. Therefore, it’s fairly good and I’m sure it will please the most casual of flyers. Camera is 2MP for photographs and 1MP for video. Photos and video are recorded into a Micro-SD card (not included, but the card reader is included). Let’s discuss the two negative aspects in X54HC. This negative characteristics are Syma’s biggest weaknesses: control range and flight time. Syma has never been ground-breaking in what concerns these two specifications. Unfortunately this new model series still faces this problems. X54HC is powered by a 3.7V 600mAh Lipo Battery (like the X5H series) and as the other series drones it only has a flight time raging between 5 to 7 minutes, not the worst but also nothing impressive. Control range is where everything goes downward, only 30 meters (advertised, yet to be confirmed), it may fly as far as 80 meters according to some experts but we still have to yet for its release to confirm. However, if 30 meters (advertised in Syma’s official website) is in fact its range, it’s one of the worst control distance for drones within this budget. We hope to see improvements in this area. Overall if you are looking for an extremely affordable camera Toy Grade quadcopter with decent image quality, easy to control thanks to the 6-Axis Gyro (fairly common among this drones), safe to fly (motors and propellers are protected by ABS plastic propeller guards) with all it needs to fly out of the box. Either to learn and practice, either to gift to someone, it’s a decent choice. Altitude Holder (Barometer Set Height) is definitely is strongest characteristics, you won’t find any other drone this cheap with this feature. So if you looking for a drone with this specific function for a very low price, this is it! 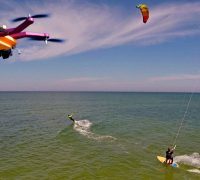 If you want this feature but you didn’t like this specific drone please check our reviews of the other drones by Syma (you can find the links at beginning of the article). Are you looking for your first quadcopter but you are on a short budget? Looking forward to try Altitude Holder feature? Well this might just be the drone for you. Easy to control, great for beginners and children. Leave a comment with your opinion on this new model series by Syma. Have you ever flown a Syma drone? Recommend this Syma X54HC review to any friend looking for an affordable Toy drone with innovative features and decent specifications. Don’t forget to bookmark our page and comeback daily, we promise you we will always have the best and most updated drone related information. It is our aim at Drones Globe to always pass on our knowledge to you, as we move together towards this new technological era. Happy flying! THE GOOD Very affordable Toy Grade drone, easy to control, it makes a good learning and practicing quadcopter. Includes one of the rarest features for drones within this price range: Altitude Holder. If you are looking for a cheap drone with this specific feature you won’t find a cheaper one currently in the market (besides other recently released Syma drones we mentioned at the beginning of the review). 2MP camera is decent quality considering the overall drone price. 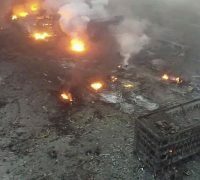 THE BAD Syma X54HC two biggest negative aspects still are the very low range of 30 meters (advertised yet to be confirmed), which is very disappointing to see in a newly released quadcopter nowadays. Flight time of 5 to 7 minutes powered by the 600mAh battery is also slightly below average. BOTTOM LINE Overall if you are looking for a very affordable quadcopter with Altitude Holder (Barometer Set Height) with all you need to fly straight out of the box, than Syma X54HC is one of your cheapest options, you won’t find a camera drone with this feature for less money. However this drone ranks fairly below same price quadcopters recently released by other RC Toy companies. The advertised control range of 30 meters is very below the average. However it still makes a good gift to offer a drone beginner or a kid just don’t expect it to do wonders. It’s a decent product for casual flyers. This is all about drones with camera! 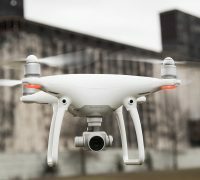 When we talk about drones with camera ,we need to know that in this category ,drones are mostly expensive and their performances are something best that technology can offer to us. So,it is really hard to choose between best drones with camera at the market ,which one is best. I started sorting drones and after hours and hours of looking and sorting them I came out with 3 best drones with camera at the market.Two of them are product of DJI and one is Typhoon newest version of Phanthom drones . These drones cost 1000+ $ and all of them have long flight time and range from 1,5 km(TYPHOON H) to even 5 km(DJI PHANTHOM 4).Their motors are strong enough to carry Go Pro camera and they are ideal for aerial shooting. But,title of best one goes to DJI PHANTHOM 4.This newest product of DJI ,producers know by producting high budget and quality drones.